Call of Duty: Ghosts is a great and comprehensive game, in which you need not only to run and shoot, but also to understand the principles of leveling and to find the right strategy in every single match. New Call of Duty: Ghosts video from the developers tells us more about operations in this game. The operations are a sort of in-game tasks, completing which you are getting special points, interesting content, additional experience and lots of other pleasant and helpful things. To find the operation, you need to go to the multiplayer mode's menu. 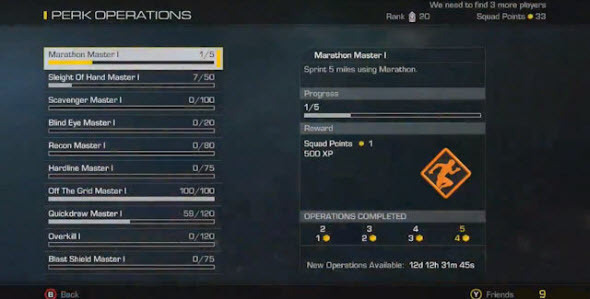 All tasks are divided into several groups, and in the menu you can find the operations relating to perks, weapons and gears together with “game mode” and “first class” operations. Was this video helpful for you? If yes, then we have another good news. The developers have promised to publish such tutorials from time to time, so stay tuned and wait for the next videos.